DTFizzix Science News: HIGGS! FINALLY! Well, it finally popped up; the elusive Higgs Boson. Just reported from CERN by two independent research teams comprised of a total of 3000 scientists and engineers! See: Science Daily and Science Magazine Online for details. The Official CERN Press Release is also cool reading. For those of you not too terribly familiar with the importance of this find, or for my AP Kids who fell asleep in May, allow me some Fizzix Pontification. There is a model (sorta full set of theories and such that works) that explains the way matter is built, how it behaves, what it's made of, and all that particle physics stuff. It's called the Standard Model of Matter (or SM of Particle Physics if you want to sound more imposing at a party...). It's basically a large set of relationships between all those subatomic particles that make up everything we see, touch, feel, or otherwise can detect and we call matter. You can think of it as a recipe for matter and the Universe. A great place to start learning about this stuff is Berkeley Labs The Particle Adventure. 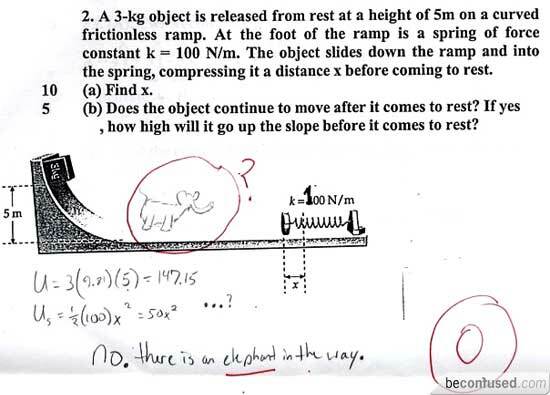 A laymen's outline? Sure. For all of the details included in the Standard Model to work, there HAD TO BE a reason for mass to exist. Believe it or not, even though we've known about all these particles and how they interact, we've never really had a good explanation of what actually caused a particle, and thereby a group of particles that make up an object, to have mass! Why do I have a mass of 110kg? Why is a quark more massive than an electron even though they are the same "size"? Well? WHY? Enter English physicist, Peter Higgs. In 1964, he, along with a few others, devised a strange sounding things called "broken symmetry of the electroweak theory". Yeah, just saying that hurts, don't it? In it, he proposed this thing, a field, an invisible force field type thing, that had to permate all of space in order for a particle to actually have mass; otherwise, there was no reason for a particle like an electron to even have mass. Without this Higgs Field, an electron could just fly around at the speed of light and have no mass and be weird like. The Standard Model (which didn't really exist like it does today...) at the time had no explanation of why mass was mass. He further proposed that the Standard Model would be fine if there were a particle that "exuded" this invisible field, called the Higgs Field", and this predicted particle was dubbed the "Higgs Particle". By the 80's this Higgs Particle had been mathematically shown to be a boson. Boson, besides being what I've called some of my bosses in the past, is the name given to a group of particles called the "force-carrier" particles. They include photons (EM carrier like light), gluons (hold quarks, therefore nuclei, together), and the Z and W Bosons. "Boson" is named after the Indian mathematical physicist, Satyendra Nath Bose, a contemporary of Einstein. Put these two names together and you get the familiar, but very misunderstood, Bose-Einstein Condensate; a topic for a later and much longer post. Bosons obey Bose-Einstein Statistics; meaning they CAN violate the Pauli Explusion Principle and occupy the same place at the same time and even have the exact same properties as each other; the same quantum state. 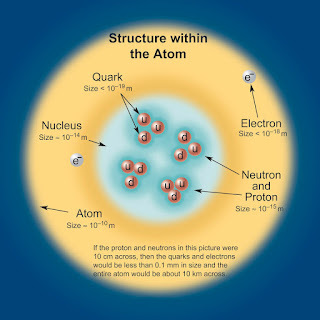 "Regular" particles like the leptons and the protons and neutrons made from quarks must obey Fermi–Dirac Statistics where the Pauli Exclusion Principle holds power; they cannot ever occupy the same quantum states at the same time. In the 1960s, Peter Higgs and a few other scientists proposed that there’s an energy field throughout the universe. This energy field is now called the “Higgs field.” The reason Higgs proposed this field is that no one yet understood why some particles have more mass than others. The energy field that Peter Higgs proposed would interact with particles to give them their mass. The idea is that massive particles interact strongly with the field, low-mass particles interact with the field only weakly, and massless particles don’t interact with the field at all. A good analogy for this is to consider things moving through water. The water represents the Higgs field. Some things (like fish) move through water very easily. These would be like low-mass particles. Other things (like me) don’t move through the water easily; so these are like high-mass particles — high-mass because they interact a lot with the water (Higgs field). 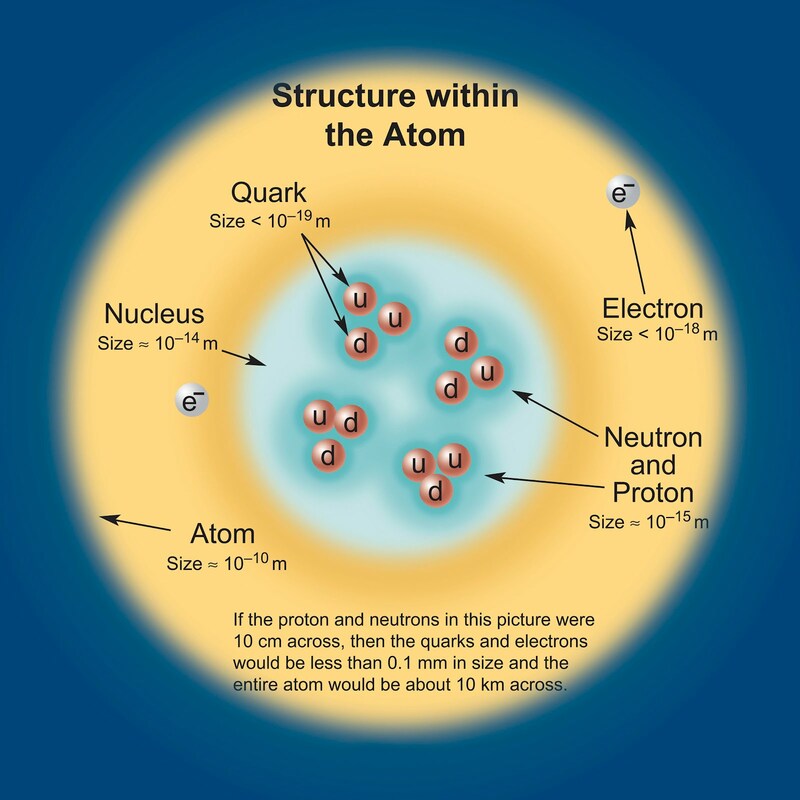 The lightest sub-atomic particle is the electron, and the most massive is the top quark. Its mass is about 350,000 times the mass of the electron — about the mass of a tungston atom. 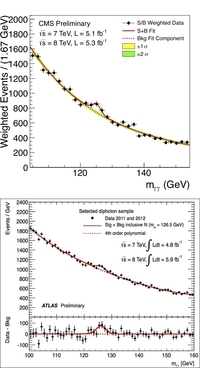 Interestingly, the top quark is not more massive because it’s bigger. It’s actually believed to be the same (infinitesimal) size as the electron. 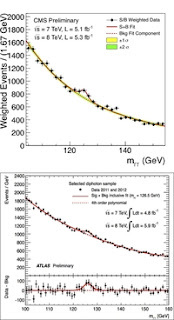 What makes the top quark more massive than the electron is simply that it interacts more strongly with the Higgs field. Now, what you’ve been hearing about is not the Higgs field, but the Higgs boson. What’s the connection? The Higgs boson is the tiniest piece of the Higgs field, just like a single H2O molecule is the tiniest piece of water. So in our previous water analogy, the Higgs boson is to the Higgs field as a single water molecule is to a large ocean of water. Just as water is made of countless individual molecules, the Higgs field is made of countless Higgs bosons.